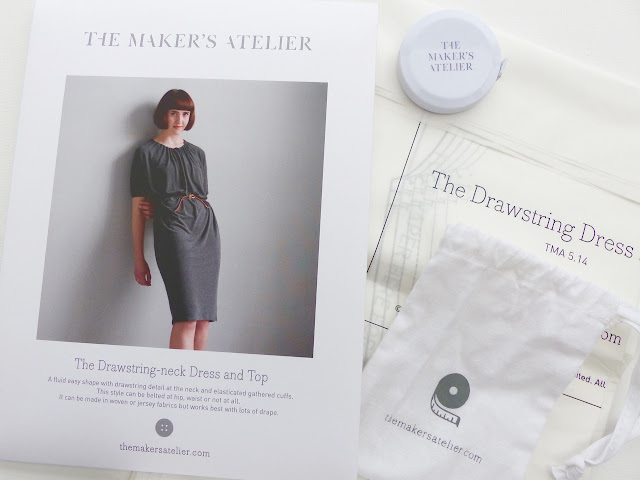 I came across Frances Tobin's online shop, The Maker's Atelier early last year and I found out more about her designs and aesthetic for my column in Sewing World about 'kits'- she sells high quality, luxury making kits as an option for her patterns. She kindly offered me a pattern of my choice to review and I opted for the Drawstring Top/Dress. Her modern aesthetic is quite different from mine, and I was curious if it would suit me. Her patterns are about simple shapes and the best quality fabrics. There is a luxe, sophisticated feel to Frances' designs. Her background is impeccable: she's worked as a design and colour consultant for companies like Gucci, Acardia and French Connection. I was intrigued to see how she brought that experience to her pattern range. Each pattern comes as a package in a card envelope with string tie; a small drawstring bag with a tape measure is included too. 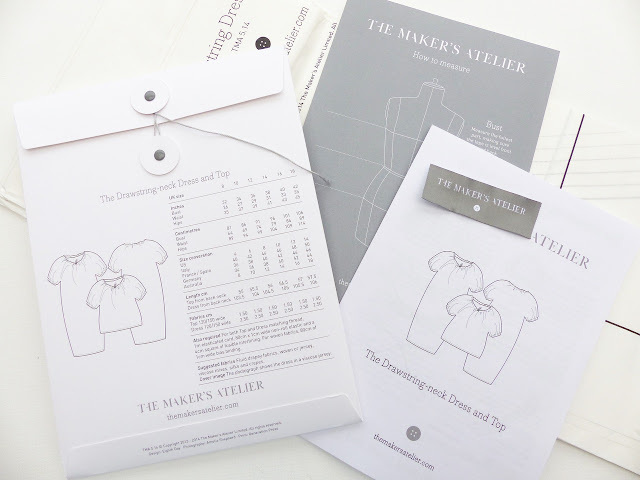 The pattern pieces are on strong transparent paper and measuring guidelines, a hints and tips card and a woven label is included with each pattern. It is a clever design. There are only two pattern pieces, the fullness is concentrated in the front piece with the back neck lying flat and the front holding the gathers from the drawstring. Finding the right fabric is essential. 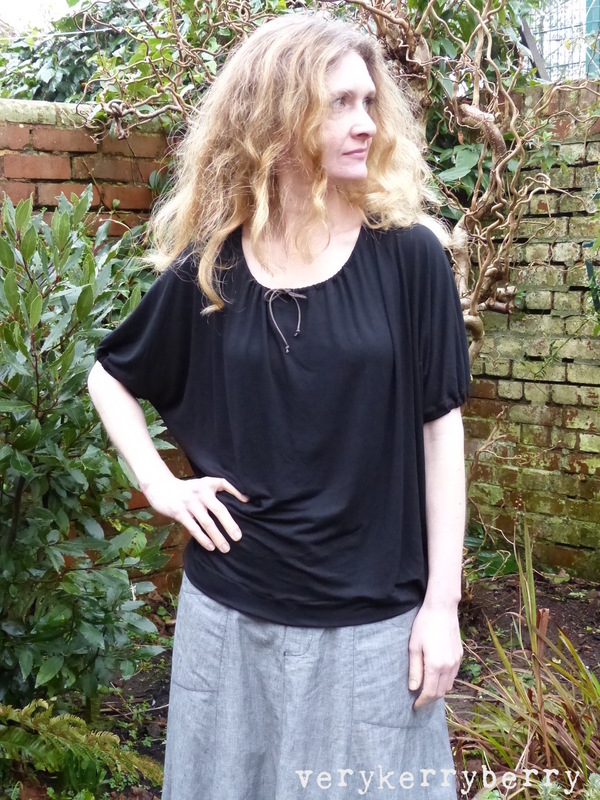 I had some thin and very draped viscose jersey which was perfect for a tester version. I followed the bust measurement and cut a size 8 with no alterations. The drawstring was some waxed cotton cord that I had in my sewing box. The instructions are detailed but the sewing is easy. This was sewn on my Bernina using a very small zig-zag stitch. The seams are unserged (knit fabrics won't unravel) and are pressed open. The top is designed for either knit or woven fabrics and there is a separate instruction for woven fabrics to finish the neck line with bias binding. You can see in the pictures why there is a need for great drape in the fabric choice. 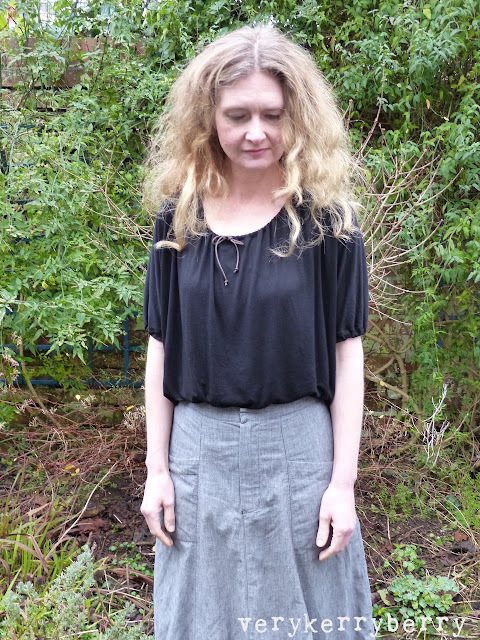 Frances has shows versions of the same top sewn in woven cotton, linen and crinkly silk as well as a design variations that that change the sleeves, add a drawstring at the waist and another which reduces fullness and sleeves for an even simpler top. Although construction is straightforward there are some nice tips for a neat finish including finishing the sleeves and neck where the elastic channels are so that it feeds through cleanly. You can see the flatter line across the back and the shoulders. This pic reminds me of my mother's adage about elbows showing your true age! Fabric quantity details are accurate. Measurements are in metric. I used my metal slider seam gauge. A pressing ham and/or a sleeve roll make pressing seams open a lot easier than using an ironing board. There's a note about pockets on the fabric guidelines which I think must be a typo- there's no pockets in this pattern! It's time for my monthly visit to Eternal Maker and I've been keeping an eye on Anna's @eternalmaker Instagram feed to track the new arrivals! I'll kick off with a wonderful fabric and pattern pairing- although this dress style would work in lots of different prints. The Frida Dress is from Eternal Maker's own Two Stitches children's pattern line and is a simple dress with pleat details with a generous size range of 6months to 9 year. 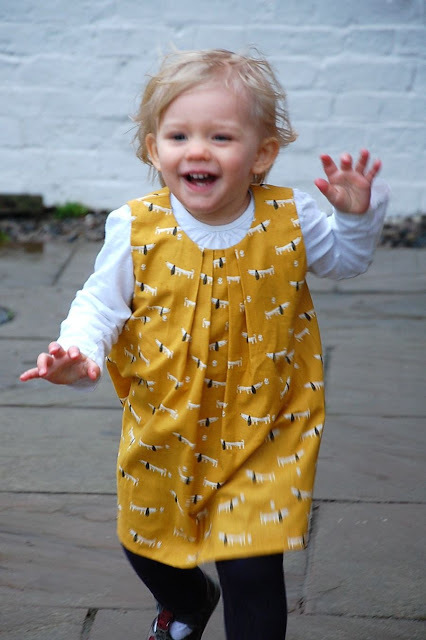 This dress has been made in Dashwood's Dachund print from the new Mori fabrics range- I think that particular print is going to be very popular! A bundle from this range is available here and a kit with the pattern and Dachshund print fabric is here. There are currently 100 fabrics to choose from in the Jersey/Knit fabrics section which is an incredible selection! I ordered two of the melange jerseys last month and they are superb quality. 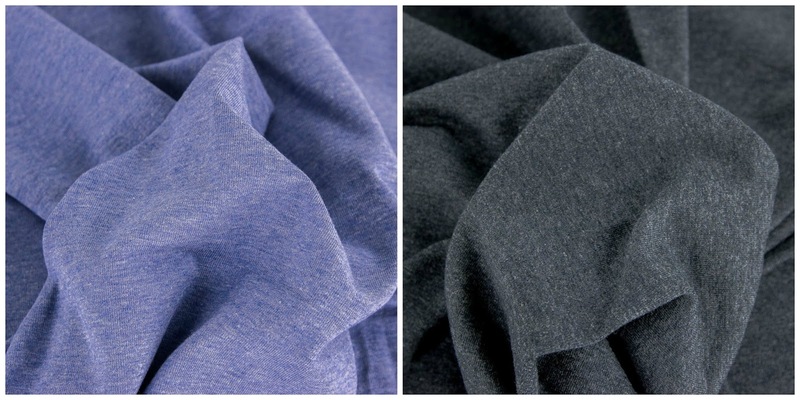 They are slightly lightweight than an Kaufman Laguna jersey which is a cotton/lycra t-shirt weight but these are opaque, stretchy and are selling quickly- the darker blue option I ordered has already gone! Here are Mid Blue and Charcoal ( I chose this one!). They would work well with clingy style tops as well as classic T shirt styles, leggings and dresses e.g. 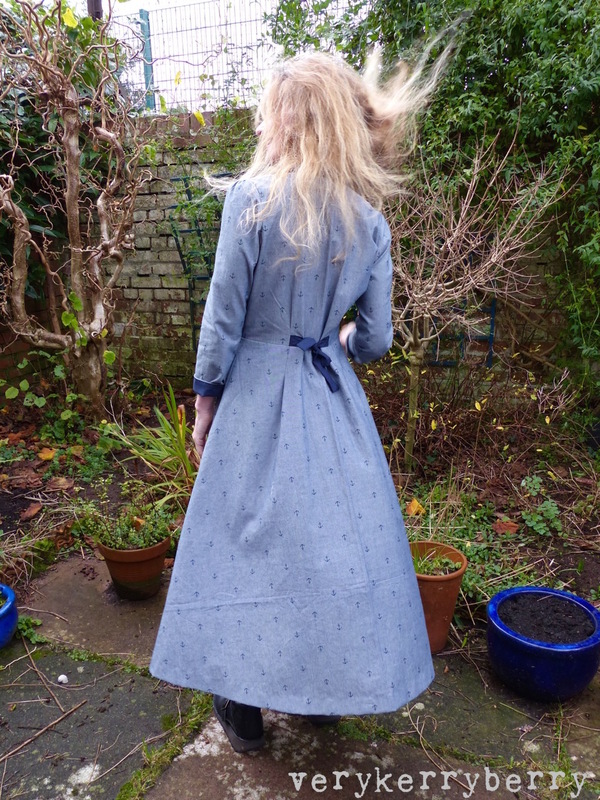 a maxi version of the Sew Caroline, Out and About Dress. The Laguna range is a great basic. Good recovery, mix of plain and marl style colours. 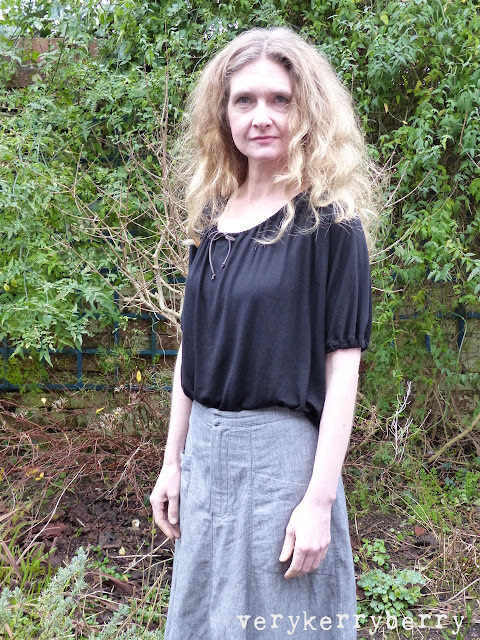 I've made a ballet style Coppelia wrap top in the Heather grey which is much worn by my daughter. Cherry is on the left and Heather grey is on the right. 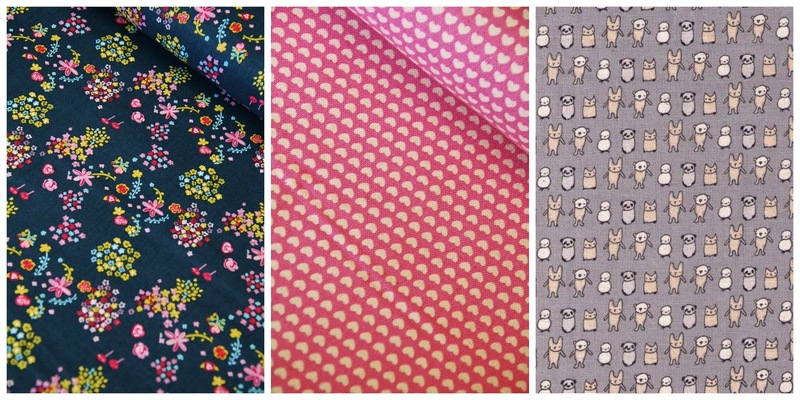 These fabrics would be good for the Marianne dress pattern and there are a lot of colour blocking options. I'm ending this post with a couple of classic cute and pretty Japanese fabrics from Creative Thursday for Kokka. 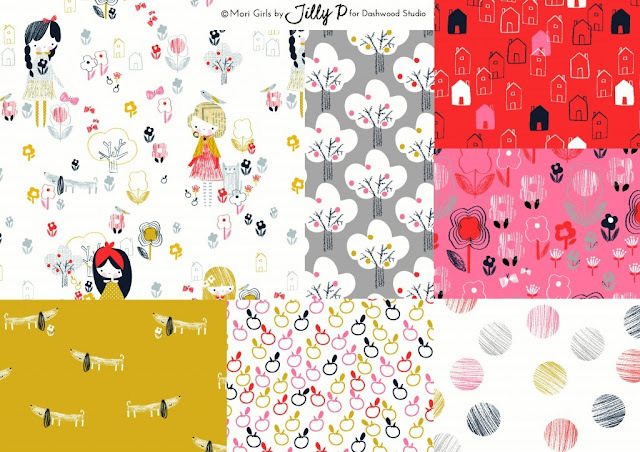 The Tinies range is a mix of florals and Kawaii cuteness. 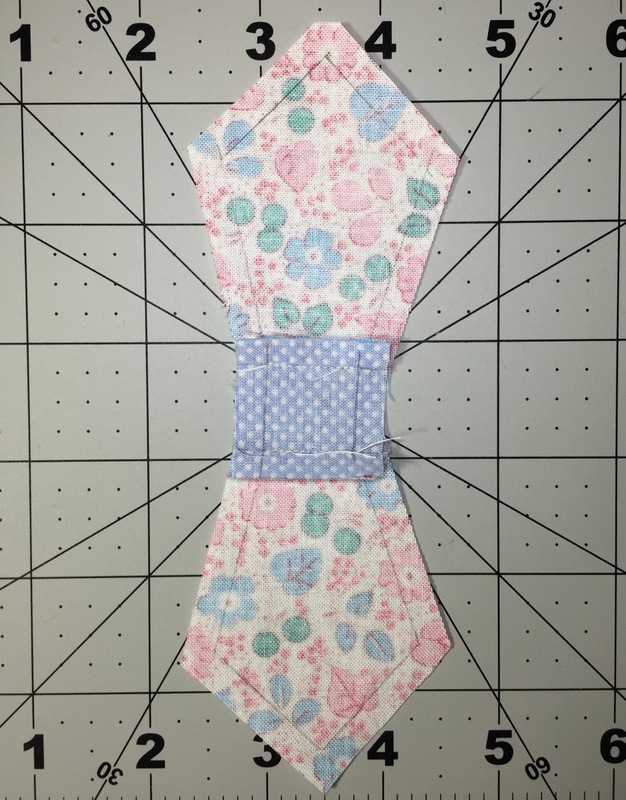 L to R: Navy floral , Tiny Hearts in pink, and The Tinies in Grey. Although it looks as though you could rotary cut and piece the squares and triangles without using a foundation pattern the precise measurements are a little fiddly. So as usual I pre-cut all the pieces adding my usual generous rotary cutting measurements for foundation paper piecing. These create seam allowances larger than ¼" so that your fabric pieces are larger than needed- if you like more wriggle room, cut even bigger! I chose fabrics with a very similar colour scheme to the original. Triangles: cut (2) 2" squares in blue and subcut diagonally to make 4 half square triangles in total. repeat the same quantities in pink. 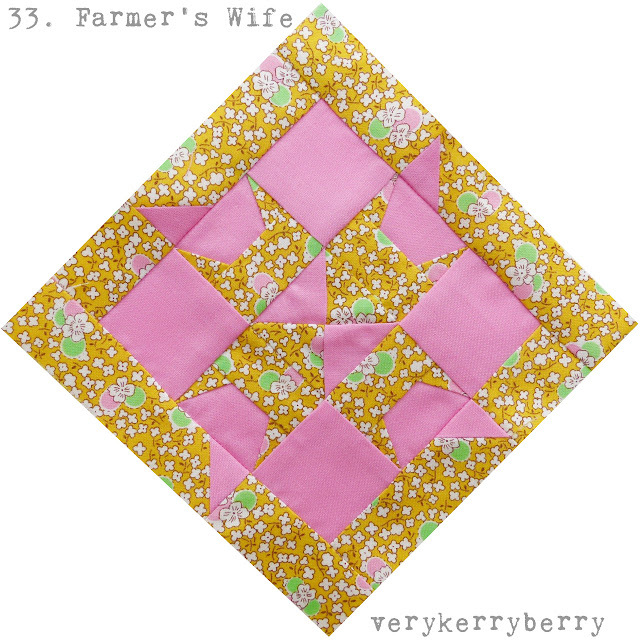 The finished block is not unlike a little picnic blanket which links nicely with the farmer's wife letter (p. 132) reminiscing over meals eaten outside. I foundation pieced this block and it was a little tricky; those small angle tapering points are always hard with this technique and getting all the points to meet up on the outer sections needed careful pinning. I'll be sharing my tips on this block on my Periscope session today which you can catch afterwards for 24 hours- see the links below. For individual blocks, you can use #georgiablock and #goldablock on Instagram, Fat Quarter Shop and Angie are using these hash tags, #fw37Georgia, #fw38Golda, I'm using both hashtag systems. Melinda from Quirky Granola Girl will be joining me as guest blogger next Monday. I hadn't sewn a Sew Over It pattern before but I've seen lots of great examples of the Vintage Shirt Dress sewn up that inspired me to give it a go. It has all the ingredients I like in a dress, an A line skirt (more so than the line drawing would have you believe) narrow V-neck line, feature collar, yoke, gathering at the shoulder. A few things are lacking- pockets being the most notable and length of sleeve being another- I would usually choose either sleeveless or full sleeved but all these niggles are easy to rectify. I made a bodice toile out of some shirting and as a result I made a few alterations to the original pattern. 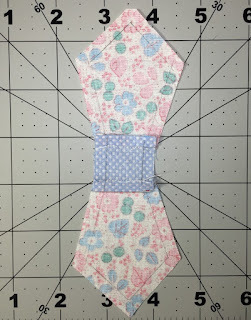 Added ¾" to bodice length (see photo below). I wanted the waist to hit me at my waistline, not above. I might shorten this by ¼" in the next version. Cut side seams between size 8 and 10. In hindsight, should've cut size 8, maybe smaller as it is generous on the side. All other seams size 8 apart from the back of the sleeve head and arm hole- cut size 10 as I like a lot of freedom to move across the back. Added 10" to length of front and back skirt- added on to the hem and flared out accordingly. Also added 10" to length of front facing. Lengthened the sleeve by 2"- the length added around 4" up from the cuffs and the side seams graded in. With the cuffs turned back they are bracelet length, with cuffs turned down, they are almost full length. Small (¼") round back adjustment. This could, will reduce it next time. Reduced fullness at the bust by removing around ½" from the top shoulder gathering area grading down to ¼" from the pleat at the waist. 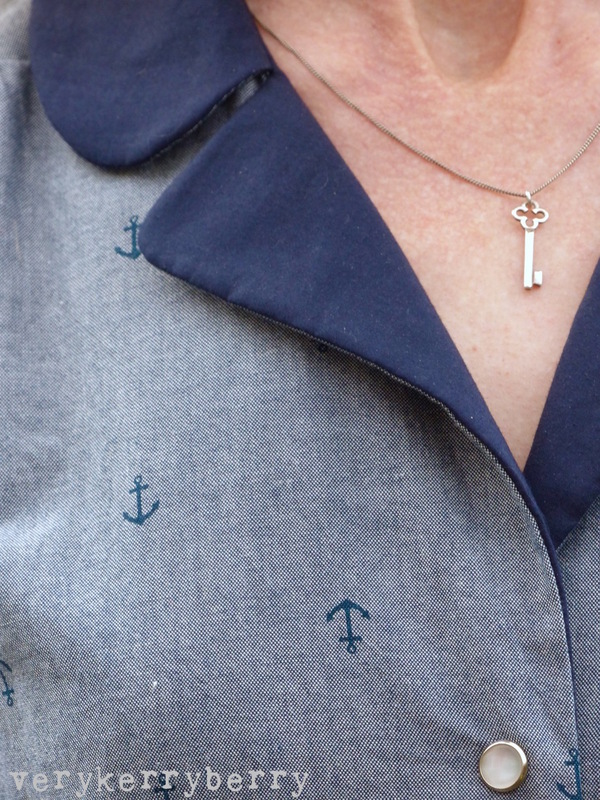 Fabric: I used Robert Kaufman Anchor print chambray from Village Haberdashery. This is a great weight for a dress. It didn't need lining an although in cooler weather I wear a slip underneath, I wouldn't need to do so on a warmer spring day. Contrast fabric is Cambridge lawn in navy, also by Robert Kaufman. This is a lovely silky cotton but I did need to take a bit of care with the iron as it easily becomes shiny. The solution us to use a pressing cloth, I use a thin piece of cotton fabric. 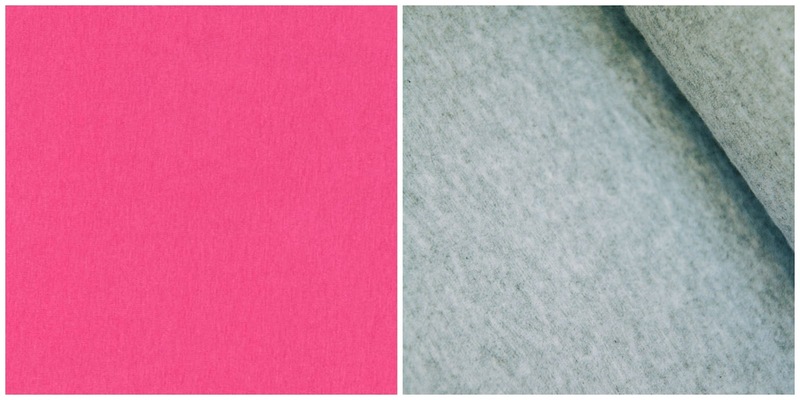 Interfacing: Perfect fuse sheer. Also added to cuffs. 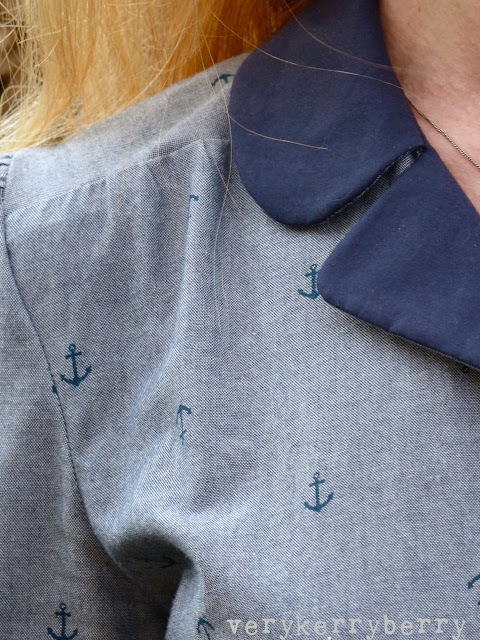 Snaps replaced buttons and buttonholes. The instructions are very detailed, especially for the collar and long facing. The shoulders ended up a little on the large side. I will reduce these by around ¼" at the armhole edge on the top and front armhole edges. The fit around the waist and sides was generous and I added ties at the back to cinch it in a little; even then there is a lot of ease. I will reduce the side seams by ⅜" on each side so 1½" in total. These are small tweaks to make and I definitely see this dress in a sleeveless version for summer. I've worn this three or four times already- firstly on Christmas day and I love it's period feel. I didn't add pockets on this particular dress but it I will on the next. 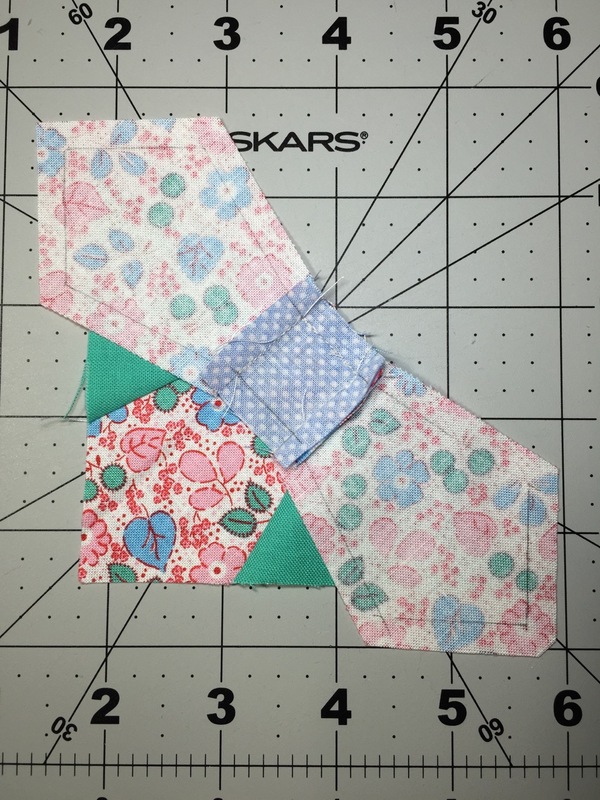 I don't know how big my project will be or whether I will sew all the blocks but I do know I will be sewing some so I bought these shot cotton fat quarters as a starting point and I'll add prints from my stash. I'm not big on planning and I like quilts to develop as I sew. These are Kaffe Fassett shot cottons from Cotton Patch. 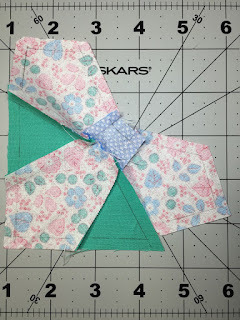 You can find fabric guidance for this project here. 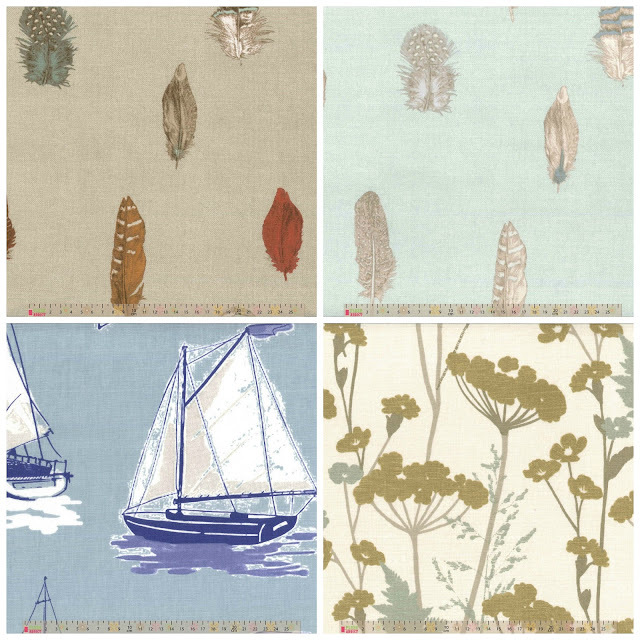 Clockwise from top left: Feathers in Natural, Feathers in Duck Egg, Floral Fields in Gold and Green, Sailing Regatta in Blue. 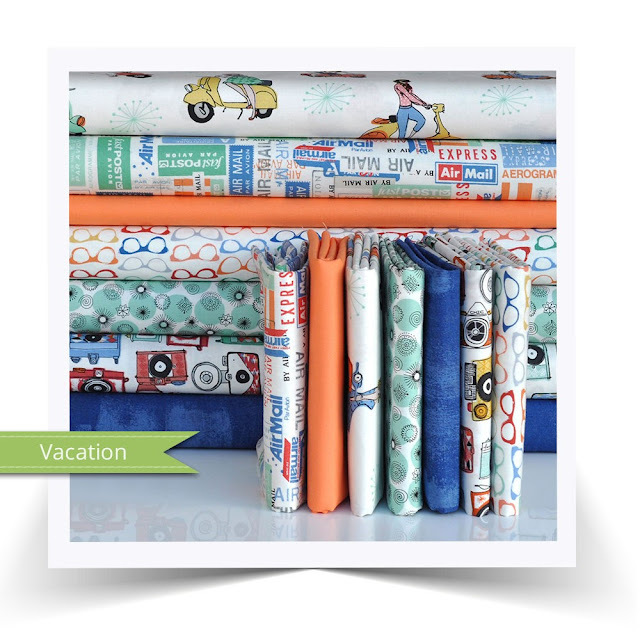 There are some new quilting cotton collections that have just arrived. 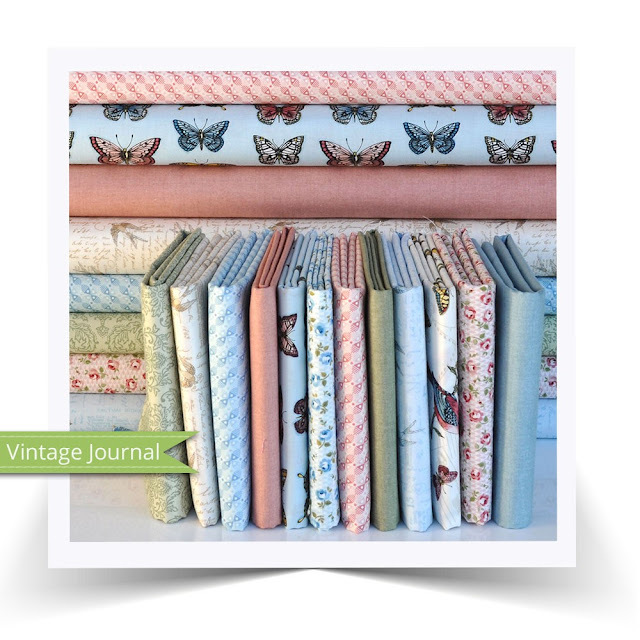 Vintage Journal is a pretty collection of traditional floral prints with the addition of birds, butterflies and vintage postcards. There are twelve prints plus an optional bird and postcard panel. The bundle option is here and individual fabrics can be found here. I especially like the swallows/text prints in cream and blue. 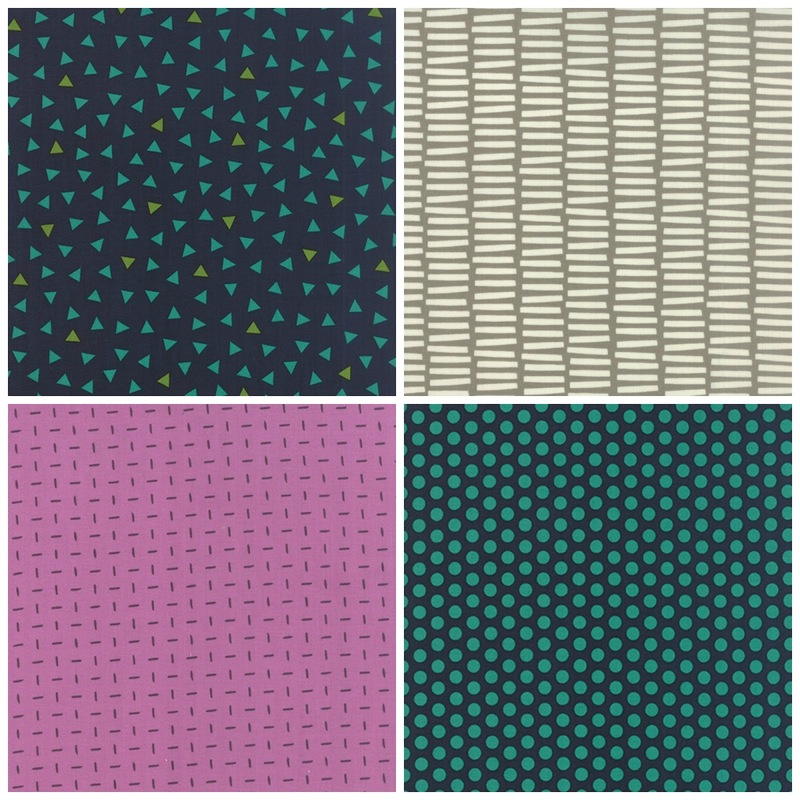 This range is from Makower- they are producing some excellent prints and they are great value too at £11/metre, Another new print collection, Vacation is on pre-order, due in any time Jan/Feb and a really fun summery selection of novelty prints. There are two new collections out from different companies that look like they would work well together, Moda have Mon Ami from Basic Grey and Dashwood have Mori Girls- there is great crossover potential for them! I've picked four prints from Mon Ami as that has arrived and I'll take a closer look at Mori Girls next month when it will have arrived (you can pre-order now). 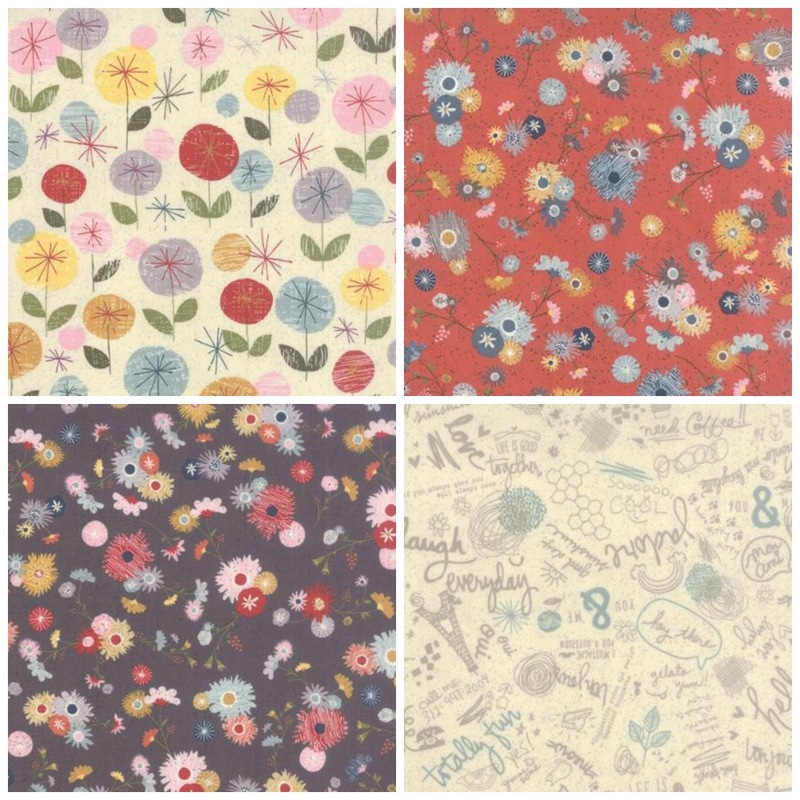 Clockwise from left: Flour Creme, Jardin Rouge, Bonjour Creme and Jardin Gris Fonce. Find a bundle of 7 FQs here. 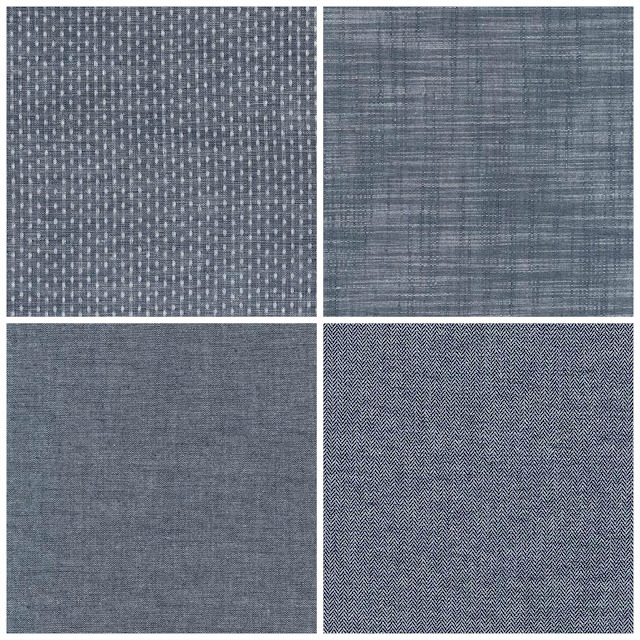 My love of Chambray continues with some more gorgeous blues from Robert Kaufman. 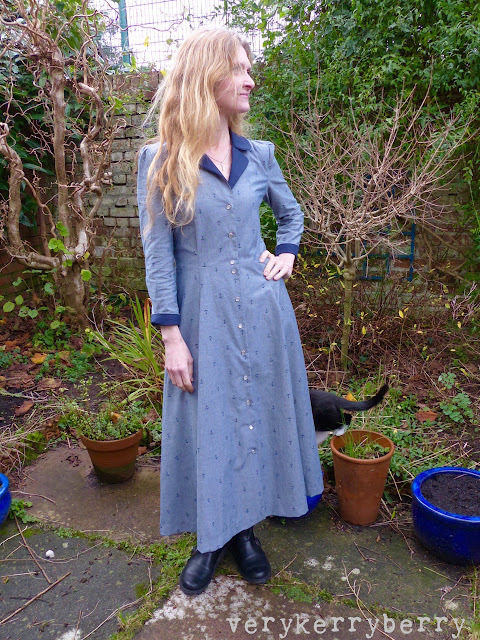 I've used the clip dot indigo before, it is quite light and floaty- see it in this Alder dress- I'm waiting for some samples of the others to check weight and thickness. 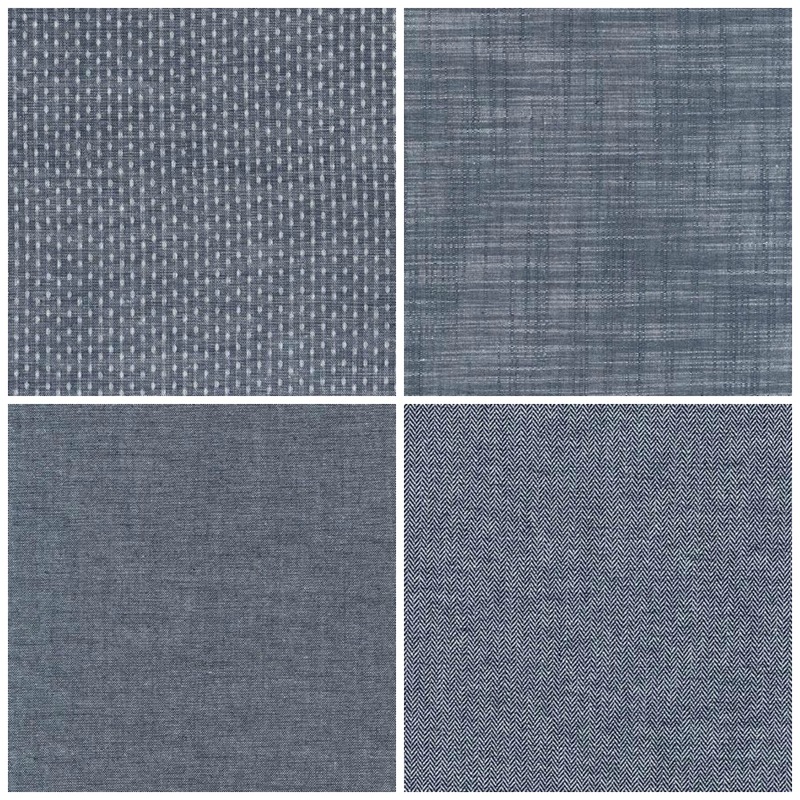 Clockwise from left: Clip dot indigo, Slub Indigo, Herringbone Indigo, shirting indigo. Check out the bargains, offers and new arrivals and enjoy your look around! 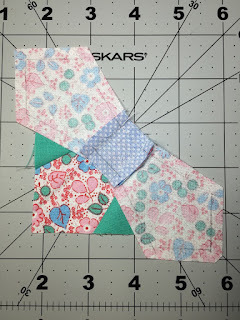 I really liked sewing this block, it was quick to pre-cut the pieces and it sewed together relatively quickly- an hour- that's fast for these blocks! Mine is in mirror image because I foundation paper pieced, Fiona used English Paper Piecing and her block matches the book. I pre-cut all the block pieces using my usual generous rotary cutting measurements for foundation paper piecing. These create seam allowances larger than ¼" so that your fabric pieces are larger than needed- if you like more wriggle room, cut even bigger! All the triangles can be cut using the rotary cutting instructions from the CD, just cut bigger to allow for foundation paper piecing. Nest seams where possible- pieces like A5 and B1 will naturally nest together. To avoid excessive bulk in the centre, when it comes to joining the sections together, I like to start the seam from the seam ends that will form the centre and begin a quarter inch in from the outside edge; it helps to mark this in pencil on the wrong side of pieces A8, B8, C8 and D8. Then sew outwards to the end of the seam. At this point, leave the seams unpressed. 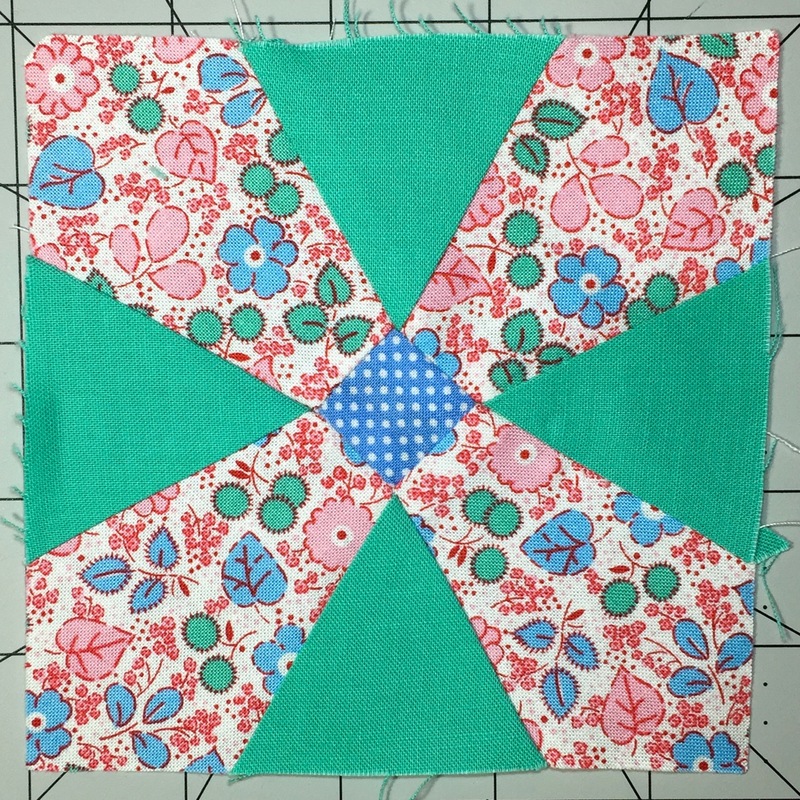 Join the two block halves together by starting in the centre, again at the exact point where the seam starts; seam allowances are behind the needle as in the photo below, and then sew to the outer edge. 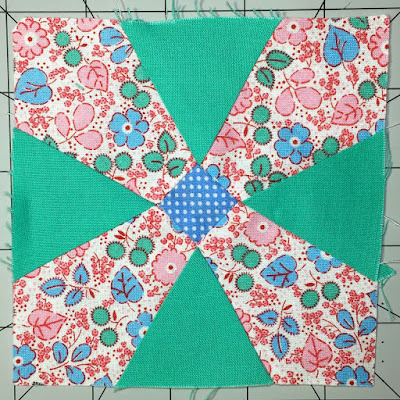 Flip the block over and repeat, sewing from the centre and sewing outwards. 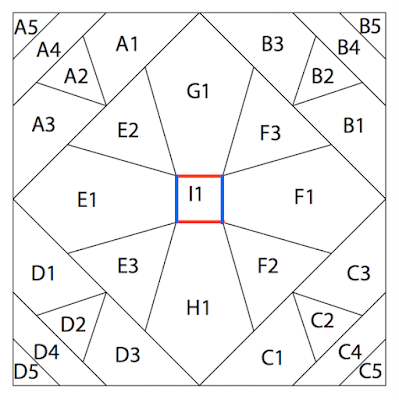 This should give you a neatly matched centre and makes it easier managing the multiple places where seam points meet. Press all the joining seams open. I added a line of stitching ⅛" in around the edge of the block to stabilise the edges. 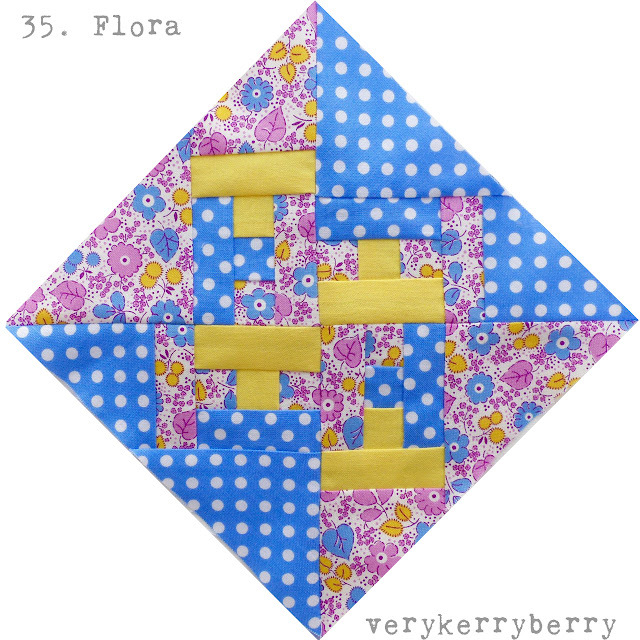 I pieced the four sections of block 25, Flora in the same way. For individual blocks, you can use #florablock and #genevablock on Instagram, Fat Quarter Shop and Angie are using these hash tags, #fw35flora, #fw36geneva, I'm using both hashtag systems. Back next Monday with Hannah from Quirky Hannah who is guest blogging. If you enjoy a sampler quilt, you might be interested in a new collaborative project coming from the hugely talented Pat Sloan and Jane Davidson called the Splendid Sampler. It's a 100 block sew-along which kicks off on 14th February and runs at a steady pace of two 6" blocks a week. There are 80+ well-known names who have designed blocks, including yours truly. 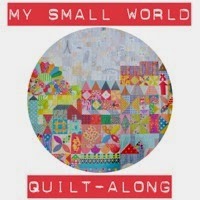 I don't really think of myself as a proper quilt block designer, especially amongst the amazing quilt designers involved but this sew-along is all about community, bringing quilters together from all over the world and I feel rather honoured to be included. 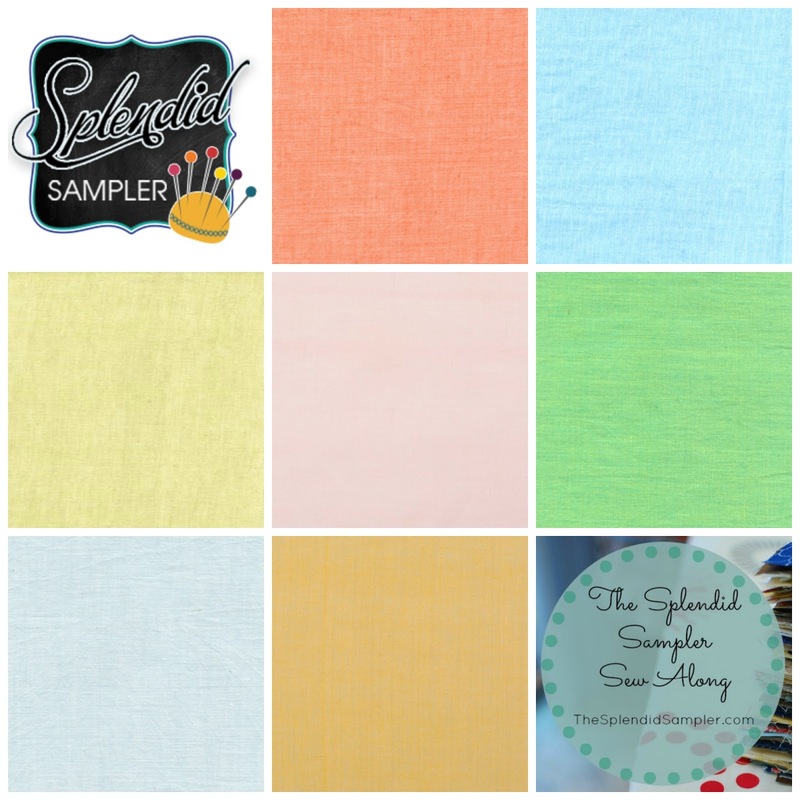 Find out more including the designers, sign up for info emails and more at the dedicated Splendid Sampler website and Facebook group. 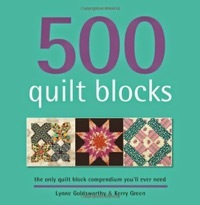 As with other blocks without vertical and horizontal symmetry, the pattern has not been reversed so the final block is a mirror image of the book version. Fern, block 34, (p.193, letter p.62) features inset seams so I thought I would go through this in detail as I know many people struggle with it. 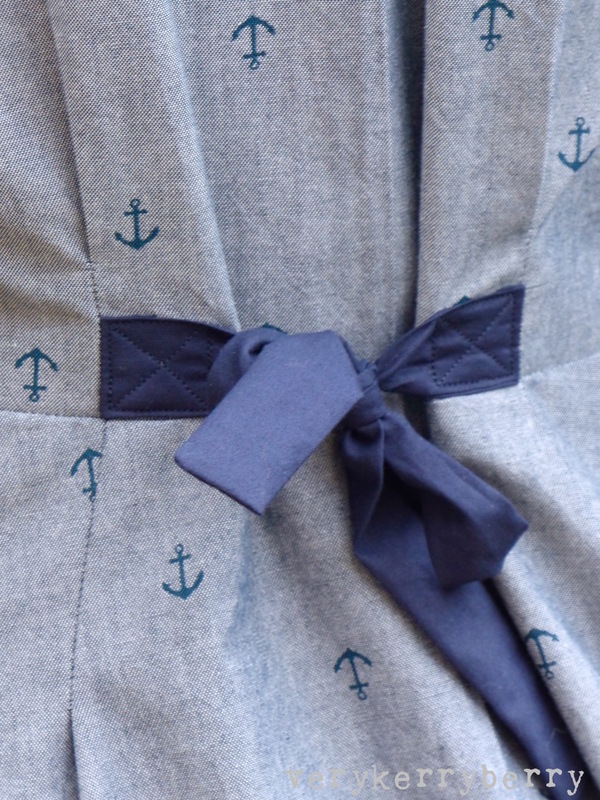 The key is accuracy and sewing exactly along the seamlines and not beyond. 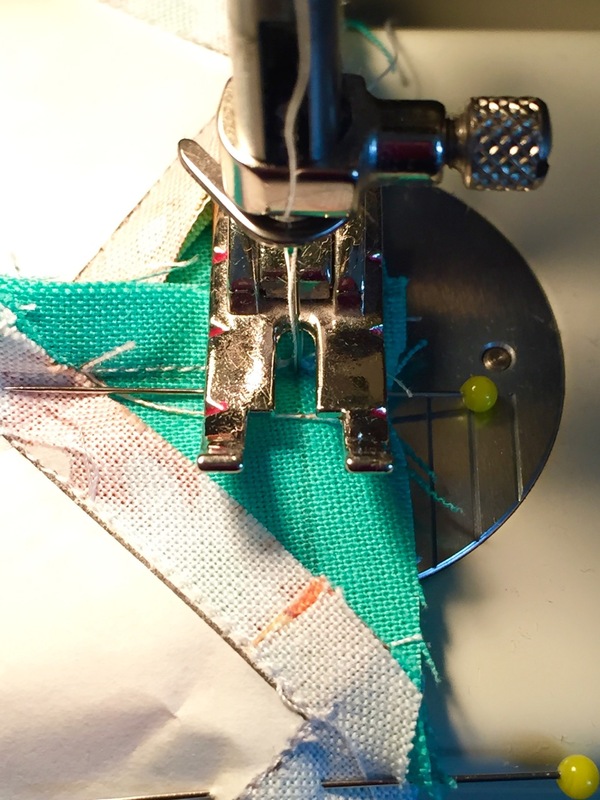 If you don't want to machine piece inset seams, hand sewing is a much easier option- it is far easier to hand piece inset seams and you could hand sew the centre square block and then machine piece the triangle corners. 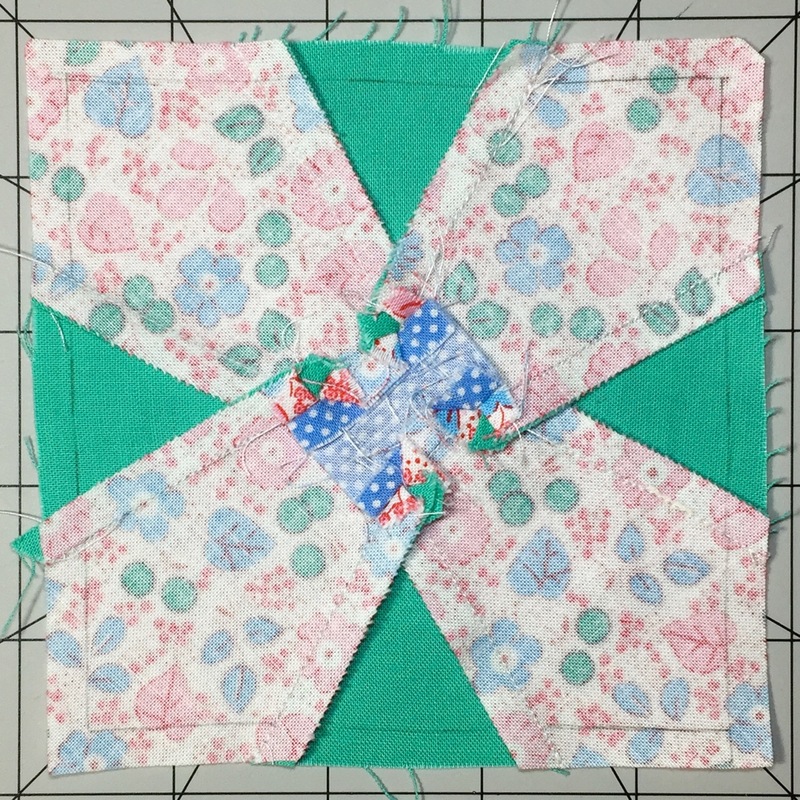 English paper piecing would also work well with this block. Rotary cut the remaining pieces using my usual generous rotary cutting measurements below for foundation paper piecing -see this post for more details on how to do this. These create seam allowances larger than ¼" so that your fabric pieces are larger than needed- if you like more wriggle room, cut even bigger! G1: Place freezer paper template on to wrong side of fabric. Press with hot iron to adhere. 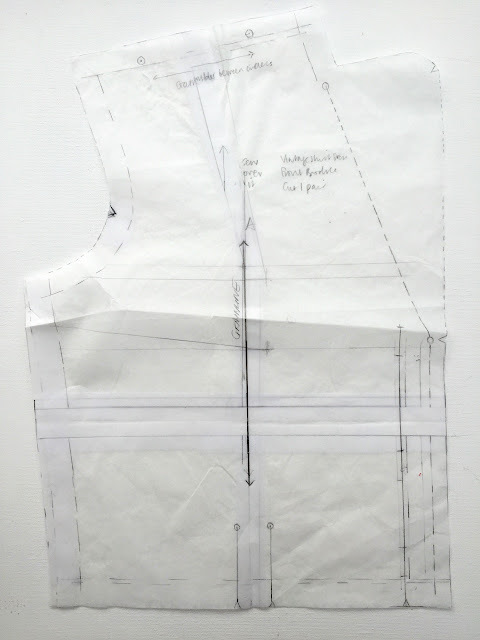 With a soft pencil, draw around the edge of the template and on to the fabric to mark the seam line. Train carefully ¼" away from this line using a ruler ( add-a-quarter is great for this) and rotary cutter. Repeat to make a second piece- H1. 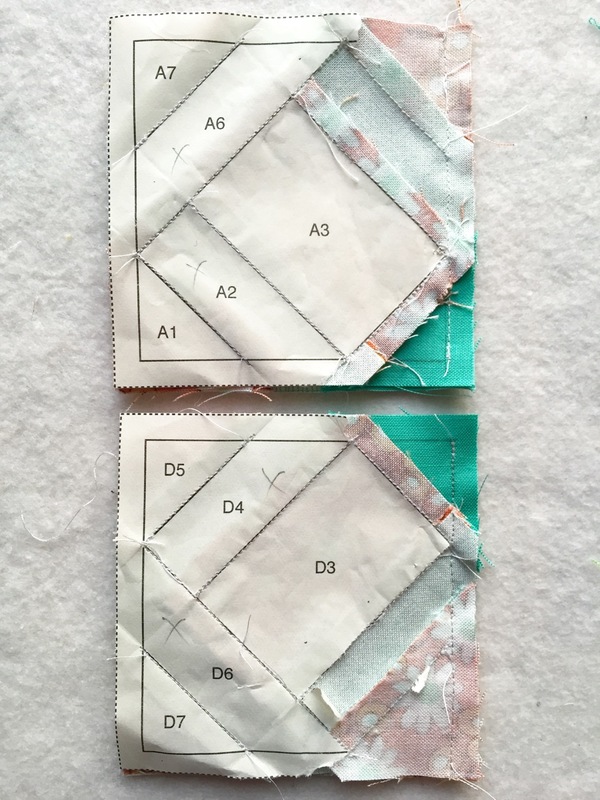 With remaining templates A1, A2, A3, E1, E2, press on to wrong side of fabrics and then cut out adding ⅜" seam allowance around the edge of each shape. 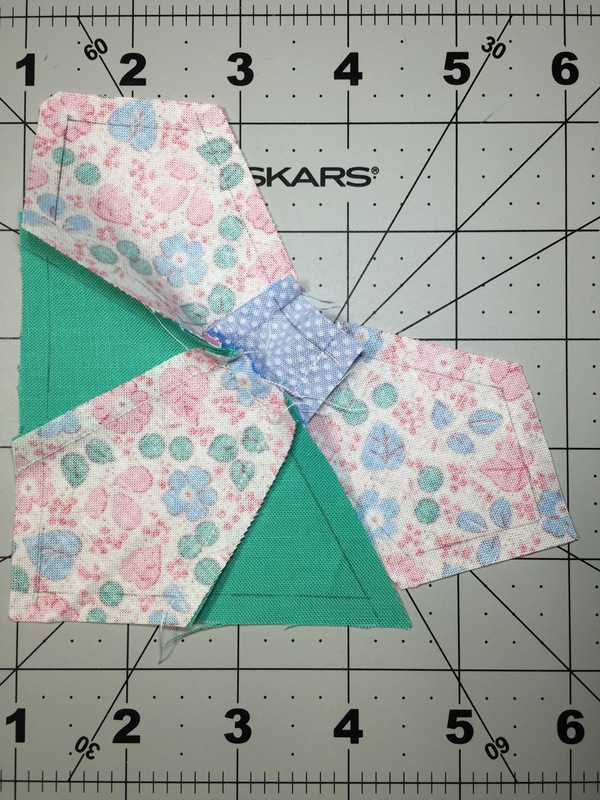 Repeat until you have all the precut pieces you need to complete the block. With inset seams, you should only ever be sewing two layers of fabricso watch out at the start and end of seams to make sure surrounding seam allowances are out of the way and you don't stitch through them. 1. 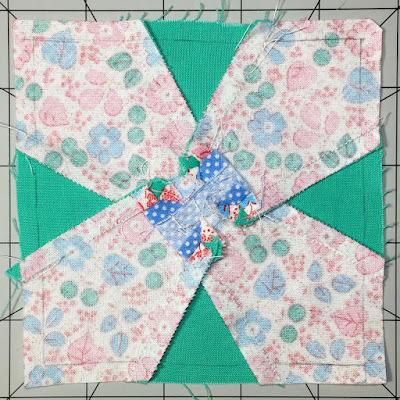 Piecing G1, H1 I1: Inset seam. 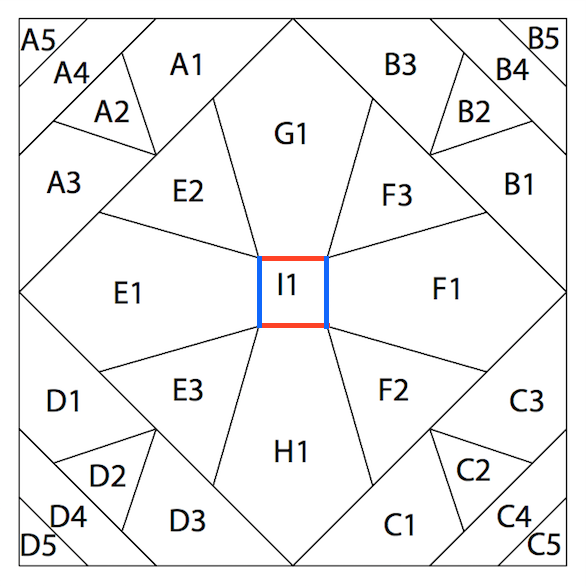 These are the seam lines marked in red on the diagram. Pin I1 to G1 using the stab pin method to mark the beginning and end of the seam. Sink the machine needle to the exact starting point of the seam and then lower the presser foot. Repeat with H1 and I1. Press seam towards H1. 2. Foundation Paper Piece sections E and F ensuring that the seams Carefully remove paper from E and F and pencil the seam allowances on the wrong side and around the edge of each sections- you will need to flip the seam allowances from side to side to allow you to draw all the seam allowances in. These are the seam lines marked in blue and orange on the diagram. i. Take section E and GHI, place right sides together and pin the seam line between joining E and I using the stab pin method to mark the beginning and end of the seam (blue line on diagram). ii. 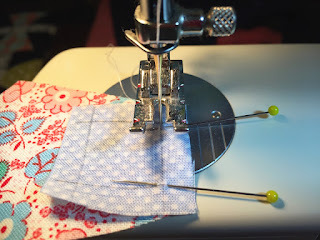 Making sure that the seam allowances at this point are flipped behind the needle, so that there are only two layers of fabric under the needle. iii. Sew the seam keeping stitches on the pencilled seam line only and not in the seam allowances- securing start and end of seam. 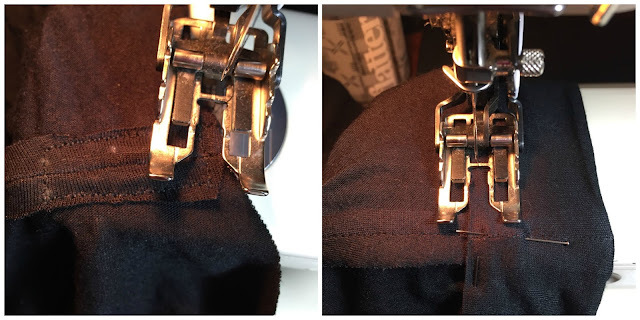 The stitches at the beginning and end of this seam should meet up with the stitches from step 1.
iv. Repeat as above with section F and GHI. 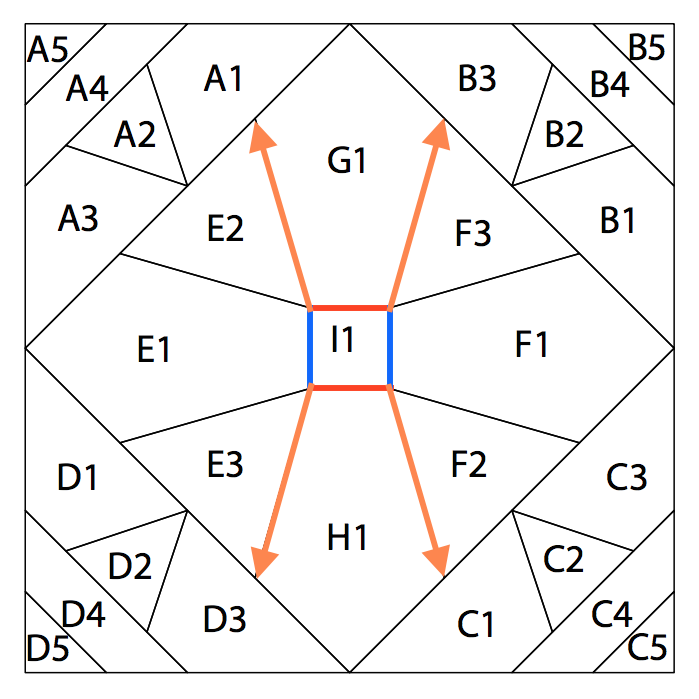 v. Take section E and GHI, place right sides together and pin the seam line between joining E2 and G1 using the stab pin method to mark the beginning and end of the seam (orange line on diagram). Sew the seam starting at the beginning of the seam line at piece I and continue to the end of the seam (following the orange arrows)- this end of the seam can continue into the seam allowance and to the end of where the E and G join. (Photos show this as sewn and then flipped round and opened out). vii. Repeat with the remaining three seams marked in orange on the diagram starting at the corner of square I1 each time and sewing away from this. Because the seam allowances are 'floating' at the end, they can be swirled to reduce bulk. The inset seams are complete! Foundation paper piece sections A, B, C and D in the usual way and join on to the central section like an Economy Square block. 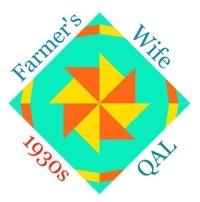 For individual blocks, you can use #farmerswifeblock and #fernblock on Instagram, Fat Quarter Shop and Angie are using these hash tags, #fw33farmerswife, #fw34fern, I'm using both hashtag systems. Happy New Year! Back next Monday with Fiona from Poppy Makes returning as a guest blogger.